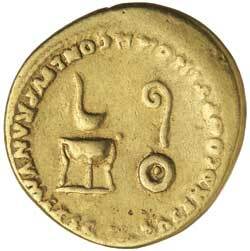 NERO, (A.D. 54-68), gold aureus, Lugdunum mint, (7.58 g), issued A.D. 51, obv. bare head of Nero to left, around [NERO CLAVD] CAES DRVSVS GERM PRINC IVVENT, rev. simpulum and lituus above tripod and patera, SACERD COOPT IN OMN CONL SVPRA NVM EX S C, (S.1915, RIC 76, Cal.441, BMC 84, C.311). 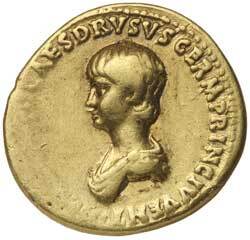 Weak on obverse and reverse legends, otherwise fine with a very fine Nero portrait, very scarce. Ex Dr V.J.A. Flynn Collection and M.R. Roberts, Sydney stock with their ticket.